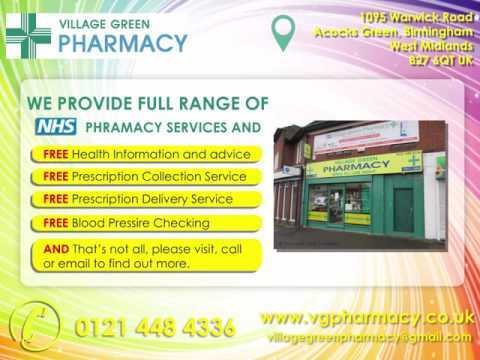 We offer free repeat prescription collection and delivery service for patients of Dudley Park Medical Centre, Acocks Green Medical Centre, Victoria Road Surgery, Hall Green Health Centre, Richmond Medical Centre and all other participating surgeries within 5 miles radius. 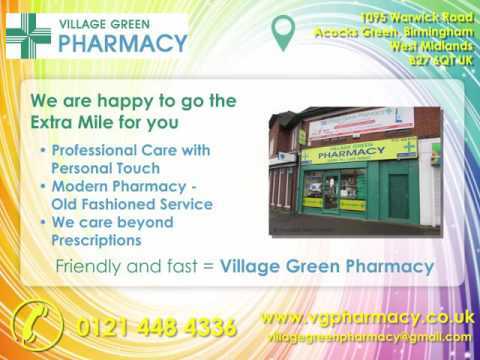 Village Green Pharmacy is a Late Night Chemist and NHS Community Pharmacy on ‘The Green’ next to Barclay Bank just opposite to the Wilko’s car park. We also provide free Blood Pressure checks, free Healthcare Advice, Complimentary and Health Supplements at highly discounted prices and Free Medicines Use Reviews, New Medicine Service on behalf of NHS for eligible patients. We have over 8000 items available for purchase on our website with big discounts and better prices than supermarkets and other online pharmacies.